Ashkenazi Synagogue is located near the Galata Tower. 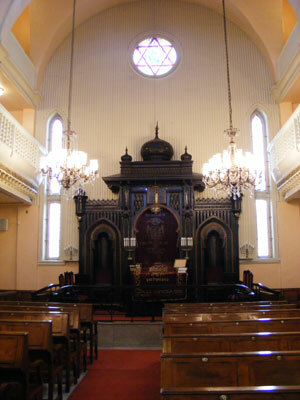 It is the only currently active Ashkenazi synagogue open to visits and prayers. The synagogue was founded by Ashkenazi Jews of Austrian origin in 1900. It is also the last remaining synagogue among a total of three built by Ashkenazim, as the population of Ashkenazi Jews accounts for 4 percent of total Jewish population of Turkey. Visits to the synagogue can be made during weekday mornings and for Shabbat services on Saturday mornings. The synagogues holds weddings, Bar Mitzvahs and other religious ceremonies in the Ashkenazi tradition. Rabbi Dr. David Marcus, who also established the Jewish school Bene Berit, served as Rabbi and spiritual leader until his death in 1938. Rabbi Mendy Chitrik serves as the Rabbi of the Ashkenazi Synagogue since 2003.